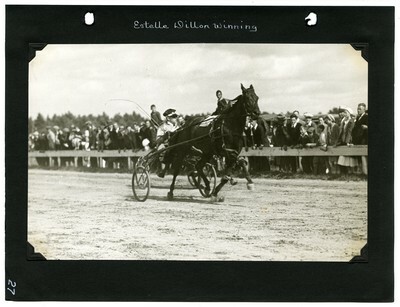 Black and white photo of bay mare, trotter Estelle Dillon driving to an apparently easy finish in one of three heats of the 2.24 Class Trot and Pace at the September 1933 Cumberland Farmers' Club Agricultural Fair races, Cumberland, Maine. Estelle Dillon, owner/driver Bray up, took the contest in three straight heats over Royal Hanover for the $100 purse. The balance of the field of horses split the heats.